One of the great things about membership of the IEHF (Institute of Ergonomics and Human Factors) is the support it provides for professionalism in the workplace, backed up by a strong sense of tradition underpinning the academic roots of the discipline. But perhaps one of its weaker points is our communal readiness to embrace new ways of working and communicating, particularly regarding social media and other online networking tools (e.g. blogs, wikis, Twitter, LinkedIn, etc). There seems to be a perception (among the wider UX community, at least) that the IEHF is somewhat backward looking in this respect, with one ex-member describing it as “another association that’s extremely old school and slooooooooooow”. Reading some of these comments, you’d think that the average IEHF member couldn’t tell their RSS from their elbow. But is this really true? Is the footprint of the IEHF across social media really that shallow, or do we in fact have a small army of nascent bloggers and tweeters? I raised the issue recently on the LinkedIn IEHF forum, and this brief article summarises the response. A few days ago I posted an article called “Ergonomics, Human Factors, User Experience: changing terms for changing times”, which examined how the usage of these terms has changed across several decades of publications in Google Books. At the time of writing, my concern was focused on a specific issue (namely the decision of the Ergonomics Society to rename itself the Institute of Ergonomics and Human Factors) and with that in mind, along with the interests of brevity, I limited the analysis to just those three terms. However, it has been pointed out since (quite rightly) that there are many other terms we could consider. For the sake of completeness then, what follows is a brief examination of some of the alternatives. We can see that HCI follows a pattern similar to that of Human Factors, with continuous growth until the early 1990’s followed by a gradual decline over the last two decades or so. By contrast, usability displays a sharp rise from around 1990, becoming the dominant term from the mid 1990s onwards. However, the decline in usage over the last half decade or so is also interesting (the peak of 2003 becomes even more apparent if you turn off the smoothing). This is somewhat puzzling… my own subjective perception, for what it’s worth, is that the term usability has developed slightly dated, “ease of use” connotations, which I personally don’t identify with quite as much as I used to. I wonder if the pattern over the last half decade reflects a wider appreciation of this point of view. But I am very sceptical of the value of this analysis. Without some way of conflating the various lexical forms and ignoring capitalisation & so on, we are not going to see a meaningful picture. 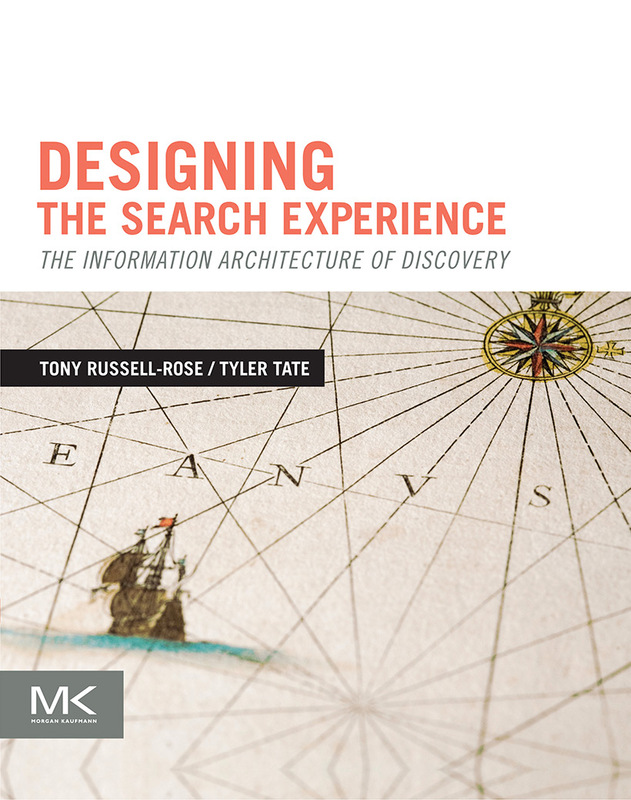 Moreover, a cursory analysis of the results returned for these terms on Google Books shows several different meanings or senses for UCD, and many more for HCD. To make this analysis meaningful we need some way to perform accurate word sense disambiguation and/or cluster the results accordingly. 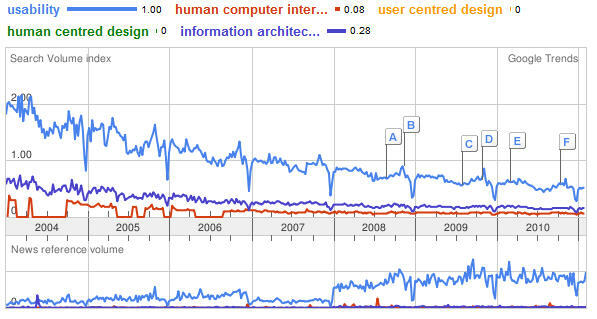 Clearly, usability remains the dominant term throughout, followed by information architecture and human computer interaction. I don’t think we can conclude much more than that without being able to magnify the scale and properly address the noise issues outlined above. However, there are two other interesting patterns in these results. First, notice that all queries appear to be declining monotonically throughout the time period. Why is this? I think the answer may lie in the interpretation of the y axis: note that this value is actually the proportion of queries, not their absolute value. So this may reflect a gradual sophistication of user search behaviour on the web, in that queries are becoming ever more diverse as new terms are introduced and average query length increases. This is no doubt facilitated by novel UI features such as Google Instant, which faciliate the expression of longer queries. In other words, although usage of each of the queries above may be growing in absolute terms, they are nonetheless decreasing as proportion of overall web traffic. Unless Google Trends discloses absolute values for search terms, we can never know for sure. Of course, word sense disambiguation is an issue that has challenged some of the best minds in NLP for several decades, so I’m not expecting overnight results here. But robust methods for document clustering are eminently available, and I can think of all manner of ways such techniques could be applied to improve the Ngram Viewer experience and in so doing provide some intriguing visualisation possibilities. I also have some initial thoughts about how to develop further insight into the context in which terms are used, which may allow us to dig a little deeper below the surface. I hope to post something about this in the next few days. In the meantime, if you have any suggestions or extensions you’d like to see, by all means let me know either here or by email. Just over a year ago the Ergonomics Society changed its name to the Institute of Ergonomics and Human Factors, in recognition (among other things) of the discrepancy between the growing range of interests within the organisation and the somewhat narrower perception of the term “ergonomics” to the world outside. There are many people who feel passionately about such terminology, and will argue quite strongly that it is perceptions that we should be changing, rather than our own identity. On the other hand, there are those who think that it is quite right that organisations should evolve to reflect the changing world, and that names and labels should not be thought of as sacrosanct. But the purpose of this post is not to enter that debate. Instead, it is to test some of the assumptions about the usage of these terms, and see if they really hold true. This task is made somewhat easier by the recent launch of the Google Books Ngram Viewer, which gives us a unique insight into the usage of terminology across a range of publications, time periods and corpora (i.e. geographically-based collections). Google Books claims to have scanned over 10% of all books ever published, providing data on the occurrence of phrases up to five words in length from 1400 through to the present day. So let’s look at the data. First, let’s see how often the terms “ergonomics”, “human factors” and “user experience” appear in all the English books indexed by Google, from 1950 to date. I have included the third term partially as it reflects my own personal interests (being by far the dominant term in the development of digital interactive products, e.g. web, software, mobile, and so on), and partially as a reflection of its growing acceptance in wider UCD circles (such as official standards documentation). The contrast between the US & GB trends is puzzling – why are ergonomics and human factors in such steep decline in GB when they are rising in the US? There must be further factors at play. Unfortunately, Google Books does not allow us to formulate queries such as “show me occurrences of these terms in all corpora except this one” (i.e. to see what the global trend is outside of either US or GB). Note also that the y-axis shows only percentages, so it is not possible to establish a baseline by which we can compare the absolute figures for different corpora. Evidently, ergonomics is still the dominant term, but both this and human factors are in decline throughout the time period (note also the seasonal spikes at the end of each calendar year). User experience appears stable and dominates the Google News content, but it is hard to conclude more without being able to magnify the scale or probe further. Over the next few days I’ll be thinking about further ways to explore or validate the above observations. In the meantime, if you want to suggest any extensions or observations of your own, just drop me a line either here by email. Quick announcement for IEHF members and recent HF/ergonomics graduates: attached below is a flyer for a mobile app design competition we’re currently running. The prize is an iTunes voucher worth £100 which will be presented at the IEHF student conference. And they say there is no such thing as a free lunch! The full text is appended below. If you have any questions about the competition itself, you can raise them here or direct to me via email. Design a mobile app and win a £100 iTunes voucher! Enter this great competition and you could win a £100 voucher for iTunes. That’s hours and hours of music, movies and TV shows! All you have to do is come up with a great idea for a new mobile app that would be of value to ergonomists and human factors professionals. It can be a generic productivity tool or aimed at a specific sub-discipline, for example, HCI, healthcare, transport, etc. The idea doesn’t need to be unique, but it should take advantage of the mobile medium. Your concept should be presented in the form of a design brief, that is, a specification containing sketches, flows, wireframes or whatever visuals are needed to communicate the design concept. Note that you don’t actually need to build the app yourself (but credit will be given for productive consideration of this issue). Questions about the competition can be addressed to Tony Russell-Rose, Chair of the IEHF’s HCI Special Interest Group (email hci_sig@yahoo.co.uk). The judges will be looking for originality, feasibility, good design and usability. The competition is open to all delegates that attend the Institute of Ergonomics & Human Factors Student Conference 2010 who are students or recent graduates (those who have graduated since 1st January 2008). The conference will take place on Wednesday 17th November 2010 at the Heritage Motor Centre, Gaydon, Warwickshire and aims to tell you all about the careers available to you in ergonomics and human factors. You will also get an exclusive tour around the Motor Centre. To find out more about the conference and to book (if you haven’t already), visit www.sc2010.org.uk. It’s just £35 for IEHF members, £45 for non-members. The competition winner will be announced and the prize awarded at the Student Conference. You need to get your ideas down on paper and email them to Kia Horrocks at the IEHF, email kia@ergonomics.org.uk. Remember to include your name and a contact telephone number. The closing date for the competition is 5th November 2010. Good luck! I don’t normally circulate CfPs here as a matter of course but this one is our own Create conference, sponsored by the IEHF. It’s also a great event in its own right – hope to see some of you there. Note though that the early bird rate expires on Monday 31st. The Create conference centres on interaction design, a young discipline with roots in human-computer interaction, ergonomics, product and graphic design, multi-media and art. An interaction designer is a difficult person to pigeon hole and can be found in mobile phone companies, consumer product manufacturers, design consultancies, as a single practitioner, or within academic computing and design departments. As well as presentations of academic research, interactive demos and student work, the conference will provide real learning opportunities through case studies, discussion and demonstrations. We also present theoretical and research perspectives on the process of design innovation and approaches to creativity in HCI; how human factors can be integrated within a creative design process, methods that encourage creativity in interaction design, and the challenges of working in multi-disciplinary teams. Mika Tuomola is artistic director of Crucible Studio at the Media Lab of the University of Art and Design Helsinki and has produced highly innovative interactive TV productions. Jason Bruges produces innovative installations and bridges his work between architecture, interaction design and installation art. He has just been nominated for a Brit Insurance Design Award for his Panda Eyes installation, originally created for the World Wildlife Fund. Prof. Ernest Edmonds, University of Technology, Sydney is one of the rare academics who has successfully brought together human-computer interaction, creativity and art. Alongside the conference and showcase, Create10 is very pleased to be presenting some of the most innovative work from current international students alongside works from awarding-winning design practitioners. A jury of design practitioners selected works from an open competition aimed at students from a wide range of creative disciplines. The selected entries will be displayed at the Create10 design exhibition from June 30th to July 9th 2010 in Edinburgh, at New Media Scotland’s Inspace. We have also agreed with the journal Digital Creativity that successful papers and student submissions will be invited to submit their work for potential publication.